This is werewolf role play. Basically there is no biography form, so just state your characters name, age, werewolf type and a little bit about them and you will get added below your wolf type. Please note, if you wish to add your characters ethnicity as well as the other information, feel free to do so. There is a shopping centre in Duluth town centre. This is where Filtered Muzik is. Filtered Muzik sells, music CDs, band/artist merch on the first floor and sells musical instruments and equipment on the ground floor. No other ranks, rest of wolves equal. Jared own a large house, just off the edge of Mercy Falls. This is where all Twilight wolves live, unless they want to live somewhere else/on their own. Oscar owns a large house, just off the edge of Jessica. This is where all the Loup-Garous live, unless they want to live somewhere else/on their own. Roland owns a large house, just off the edge of Roseville. This is where all the Time wolves live, unless they want to live somewhere else/on their own. Everyone knows Twilight? Well those werewolfs transform exactly like in twilight, they roughly have the size of a human. They are incredably powerful and if endangered, aggresive. Zachary = Zachary, 20 yrs old. Zach has shaggy black hair and deep set, sensual dark eyes. He is an emo and very cautious about new people. Zach is shy and quiet. He allows his friends to call him Zach, Zachy or Z. Calmness comes natural to him and he takes part in various urban sports. His favourite and best are free-running, skateboarding and BMX.He loves heights and his favourite bands are : Death Cab For Cutie, Gorillaz, Paramore and Jimmy Eat World. Faith = Chelsie, is a nineteen year old female, she has long black hair and dark brown eyes. She is tall, slim, she moslty keeps to herself. Chelsie turns into a black wolf with dark blue eyes. They can transform in a wolf anytime they choose, when they are transforming, they are giving off light. They look exactly like a normal wolf, but almost all the loup-garous have silver eyes when they are wolves. They are not as strong as the twilight werewolves, but are massively faster. Sabria = Astra. Astra is a 19 year old female, with long straight black hair and dark skin. She is tall, and has green eyes with silver and gold flecks. In wolf form she is a slim wolf with black fur and dark red-wine accents. She is very outgoing and strong-willed. She is a loup-garou, and the light she emits is golden and silver. Fenris = Leah, 19 year old female. She is very quiet but a lunatic around her freinds. She does not like who she is and tries to hide her whole life from everyone. She know no one that is like her, and therefore feels like a outcast. She is tall, with fiery red hair, and dark eyes. She keeps to herself but loves a good run. She is a Loup-Garou, the light that gives off her wolf form is deep purple, tinged with black. These wolves have been travelling through time, because unstable nature at that time. Upon finally becoming stable they reach this modern time frame, they cannot travel anymore. The time wolves are often all from different era, they are very noticable due to their clothes sense and their speech/accent. Their clothes sense is what was fasionable at the time before their unstable period, along with their accent. They are a little stronger than Loup-garous but not as fast, but are the best swimmers. For this type of wolf, please note the time period in which your character was born and spent their time before their unstable period. Sabria = Avaritia is a 18 year old female Time Wolf who lived in the time of ancient Rome, so you can't understand her very well. In human form, she is a beautiful young woman with a elegant white roman tunic, and sparkling yellow eyes. (not literally sparkling). In wolf form, she is pure white with rich brown runes on her left shoulder. Fenris= Leah. Leah is a 19 year old female. She is very quiet but a lunatic around her freinds. She does not like who she is and tries to hide her whole life from everyone. She know no one that is like her, and therefore feels like a outcast. She is tall, with fiery red hair, and dark eyes. She keeps to herself but loves a good run. She is a Loup-Garou, the light that gives off her wolf form is deep purple, tinged with black. In her wolf form she is black as night, with purple socks. Sabria= Astra. Astra is a 19 year old female, with long straight black hair and dark skin. She is tall, and has green eyes with silver and gold flecks. In wolf form she is a slim wolf with black fur and dark red-wine accents. She is very outgoing and strong-willed. She is a loup-garou, and the light she emits is golden and silver. Sabria=Avaritia is a 18 year old female Time Wolf who lived in the time of ancient Rome, so you can't understand her very well. In human form, she is a beautiful you woman with a elegant white roman tunic, and sparking yellow eyes. (not literally sparking). In wolf form, she is pure white with rich brown runes on her left shoulder. 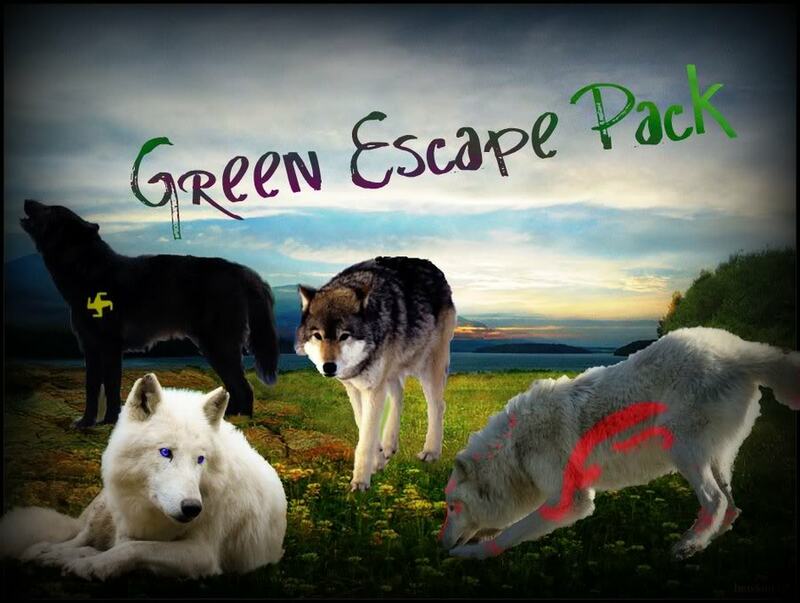 Scarlet=Sapphire is 18 yr old female,she has long blond silky hair and diamond blue eyes and is tall.In wolf form she is black and white with One green eye and one blue eye and a purple fur down her muzzle.She is a Loup-Garou.The light she gives off is a Blueish Green. I wake up that morning and my family is up already."Hi. "I say and get some coffee. I woke up, just laying in my bed, staring at the ceiling. "Another school" I moaned, this was my third one this year. "Can't wait to be judged." I told myself swinging my legs off the bed. I raked a comb through my messy hair, threw on a t-shirt and some jeans. I grabbed my bookbag and headed to school. My parents had gotten me a way fancy car as a sorry for making me move again. I got in and drove off to the unforbiden day ahead. Chelsie watched the sky as she walked"Great a new day" She said sarcastically to herself. "Oh my gosh!Im gonna be late! "I yell and hurry to go get dressed.I threw on my clothes and combed my way there.I ran to my car and turned it on.It took a few minutes to get there. "Im not late.Thank goodness! "I parked and got out. I walked through the doors of the school and it quckly went cold.I put my jacket on and hung around till the bell rang for class. I parked my car and walked up to school. I went to the office and got my chedule, I kept my gaze down, not wanting to attract anyones attention. I had literature first. I headed and sat at an empty table. I got bored and looked at my schedual. "My first class,Literature.Ugh,im horrible at literature. "I say.I walk to my class and sit in an empty seat.Sometimes i just want to transform into my wolf self and scare the teacher into letting me out early.....I thought. I watched the students filtering in. Hope no one finds out I whisper thinking of my first school this year and why I had to leave. I sit in my seat bored to death. "Is it against the rules to just walk out of class,cause his place is already boring me and we didnt even start. "I tell everybody. I keep my eyes trained on my book, looking up only once the teacher began. I sat in the boring clasroom for about an hour writing notes.Im bored.I thought. After school let out I went home. I dropped my books and ran deep into the woods. Once I felt I was far from civilization I changed. I ran out the school doors just as the school was over.I ran out before anyone else and went to the forest near the school and sat my book bag down. "If i tear my clothes my mom will thing ive been fighting and kill me. "I whisper.So looked around to see if any wierdo's where looking and undressed and put my stuff high in a tree and transformed.I ran as fast as i could,loving the rush. I ran and ran, loving the feeling of my fur blowing in the wind. I could smell another wolf, a real one probably. I smelt another scent and didnt worry about that,"propably full wolf. "I mutter.I stopped running and ran toward the full wolf,wanting to say hi.